“Ooh, my little babies!” she exclaimed with cheer, reaching up with her hand and gently brushing the littlest of green buds that had emerged on a tree branch just above our heads. 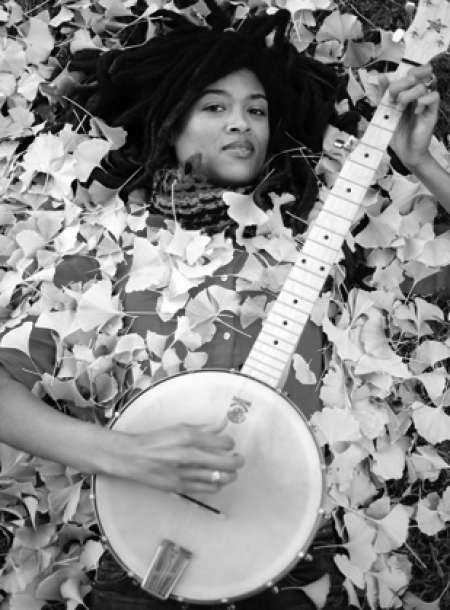 It had been a real, old-fashioned New York winter, and spring had only just arrived when Valerie June and I walked around the East Village on that late April evening. And no one was happier than the girl from Tennessee at that moment. The first warm evening breeze. The scent of blossoms in the air. Sparrows hopping along the sidewalks. She took it all in. “I just was thinking about how magical listening is, and how sometimes I don’t listen to music but I’m listening to the world and the space between actions. Hearing the space. And it’s just one of those things where I don’t really feel like I have to be listening to somebody’s made music that’s made for me to hear all the time. I just listen to the world and the sounds that it makes, and that creates some kind of music for me." She looked down and tied a gentle little knot in her hair, and almost began speaking again. But just then she leaned back, raised her hands up over her head, touched the wall behind her, and reflected – didn’t say anything – just took a breath and reflected for a moment. It’s a clarity and freeness that’s been manifesting itself through much of her daily life. “At the beginning of the year I spent a couple months going through bags and boxes of just papers. Bills. Letters. Receipts. Songs that I’ve written that I haven’t done anything with. Loads. Organizing all this stuff. And now I have it by folder, file, box, tapes; I organized all the clothes and pretty much everything that I had." "I used to waste time like, I started writing that song. Where did I put that song? And it would be weeks of me looking through stuff, trying to find this napkin that I started writing this song on so I could start writing it again. By the time I found it I wouldn’t even care about the song anymore. I’d be on to another one. So the feeling was gone." The peaceful place she’s achieved became more are more apparent as we ambled down the sidewalk that evening. Occasionally she’d stop and glance, carefree and quiet, at trays of jewelry out for sale in front of a store. Maybe not as much to buy as to simply be transfixed by the charm of it—the smooth curves and lines of all those silver rings. And I’m not sure how much or how little she’d notice when others, young and old, would gaze and fawn over her hair as they walked past. But she’d smile all the same. Valerie June has only lived here for a short time, and even then it’s only during part of the year. But I could have assumed I was alongside a native New Yorker—galloping up and down stairs, avoiding the waves of rushing pedestrians even with that guitar case strapped across her shoulders. I think she’s really enjoyed it. Lately she’s even played her music on subway platforms. I can understand why he cried. Valerie June’s voice is perfect for that song — authentic, bright, honest, unassuming. Add it to those melodies and lyrics and the brand of music she plays (she calls it organic moonshine roots music), and you’ve got a pure reaction. Just watch and listen. Are you starry eyed? Smitten? Wanting to know where that voice is coming from? It couldn’t be anything else. She’d be the perfect girl to walk through a meadow with. Or listen to a bullfrog with. Or recount childhood memories with. And her performances have been developing. She’s been studying. Taking time to think about how to relate stories and proverbs to her songs. She knows it’s a work in progress. “To think that you have to go into a performance and have it be perfect is just all wrong, you know what I mean? Because it’s a part of the process; it should be as good as you can make it, but the way the crowd responds to it determines if it’s finished or if you need to go back and be like, I ain’t saying that again. So, part of what I want to do now is I just want to learn different ways to communicate with the audience." “My grandfather had a guitar and it was always in the closet. We would go visit my grandpa and grandma, and we would be out playing and come in and eat and play around the house, and every once in a while we would do something like open the closet where the guitar was and try to touch grandad’s guitar. And he would get mad and would be like, “No! Y’all get outta there! You’re not gonna touch my guitar!” He didn’t ever touch it, either." I wondered where her grandfather got the guitar to begin with. Stories like that and the way she plays on stage make me think I almost don’t need the fanfare and technicalities of a studio album. I’d be more than happy if someone would just follow her around with a recording device, documenting her music and her stories as she goes.